Two major chipset company Qualcom and HiSillicon designed powerful Processor for Smart Phone. Huawei was the first with its kirin 980 and now Qualcom withits Snapdragon 855. The Qualcomm Snapdragon 855 platform uses eight cores, arranged in atri-cluster pattern. All the cores used here are Qualcomm’s latest generation of the Kryo cores, which actually feature a semi –custom designed, taking reference from existing design from ARM’s cores. In the three clustor arrangement, the first cluster uses four kryo 485 silver cores, based on older ARM Cortex-A55cores the peak speed of 1.8 GHz. The second group uses three Kryo 485 ‘gold’ cores which are based on ARM’s latest generation Cortex-A76 cores and are clocked at upto 2.42 GHZ. This cluster will be used in slightly more intensive task such as casual gaming or heavy application. The third cluster, intestingy, comprises a single core one Kryo 485 ‘prime’core, with its peak clock speed unlocked till 2.84 GHz. The Kirin 980 was technically the very first to have launched with TSMC’s 7nm FinFET Process So tha it also became first in the World to use a Coryecy-A76 core that works in a 2+2+4 architecture. The two big cores uses A76 cores with the clock Speed of 2.6 GHZ, while two more A76 cores have ben put in place to handle medium- intensity rasks and are clocked at 1.92 GHZ. The Four small cores use Cortex- A55 cores and run at 1.8 GHz Clock Speed and use ARM’s latest DynamLQ CPU Controller. CPU Config: The CPU configuration of Qualcomm Snapdragon 855 is 1x Cortex A76 @ 2.84GHz, 3x Cortex-A76 @ 2.42GHz, 4x Cortex-A55 @ 1.8GHz. While The CPU Configuration of kirin 980 is 2x Cortex-A76 @ 2.6GHz, 2x Cortex-A76 @ 1.92GHz, 4x Cortex-A55 @ 1.8GHz. GPU Config: The GPU Configuration of Qualcomm Snapdragon 855 is Adreno 640 While The GPU Configuration of kirin 980 is Mail-G76 MP10. Memory: Qualcomm Snapdragon 855 Supports UFS 3.0 Memory whereas kirin 980 Supports UFS 2.1. Process: Qualcomm Snapdragon 855 within 7nm FinFET process whereas kirin 980 is also within 7nm FinFET process. Video capture: Qualcomm Snapdragon 855 supports 4K UHD, HDR @ 60fps while kirin 980 supports 4K @ 30fps. 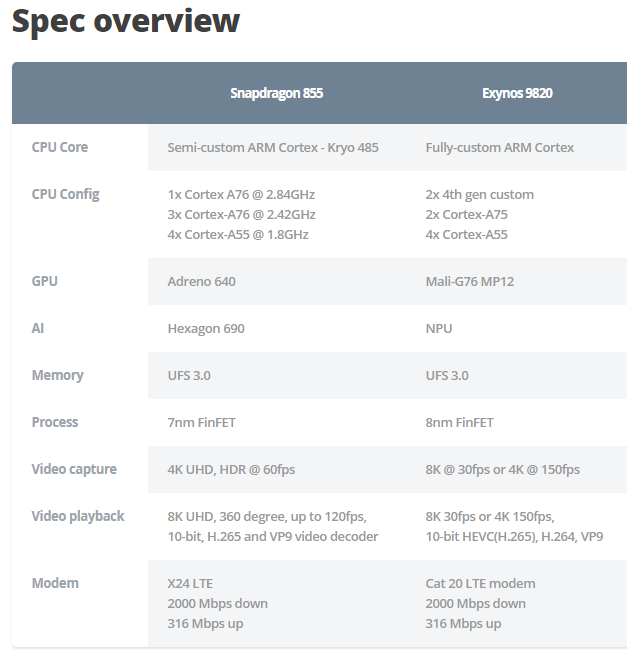 Video playback: Qualcomm Snapdragon 855 supports 8K UHD, 360 degree, up to 120fps,10-bit, H.265 and VP9 video decoder whereas kirin 980 supports 4K @ 60fps. Modem: Qualcomm Snapdragon 855 supports X24 LTE,2000 Mbps down, 316 Mbps up whereas kirin 980 supports Cat 21 LTE modem, 1400 Mbps down, 200 Mbps up. Qualcomm Snapdragon 855 review is better than kirin 980 review. However the performance wise both are the same. Qualcomm Snapdragon 855 used By Samsung , Sony and other big branded company where as kirin 980 used by the newest branded mobile company Huwaei, Honor. You can prefer devices having any of the two chipsets.